The subject of bottle identification and dating is a difficult proposition for whole or entire bottles. 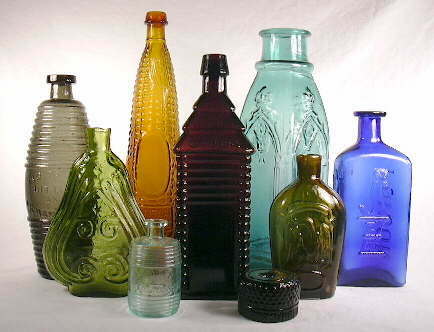 This is indicated, at least in part, by the girth of this Historic Glass Bottle Identification & Information Website which frequently notes the complexity of the subject and the diversity of different bottles. Considering how complicated whole bottle identification is, the subject of fragment identification is many times more difficult to address since you reduce the amount of "evidence" to work with to just a fragment or two of an historic bottle. That does not mean that fragments can not be identified, but rather, it means that it is more a matter of depth of experience on the part of the observer in looking at and handling thousands of different bottles than a subject that can be covered in even a minimally meaningful way by any webpage or website...or any publication for that matter. Since there were several hundred thousand different bottles produced in the United States (and Canada) between 1800 and the 1950s, it is beyond the scope of this or any website (or book) to provide specific details about more than a tiny fraction of those bottles (Fike 1987). This site instead attempts to help the user determine some key facts - approximate age & function - about a given bottle based on observable physical characteristics. Given the above, fragment identification is an almost impossible task to describe and summarize in any fashion since any given fragment could be from any one of thousands or even tens of thousands of different possibilities. It is difficult enough for people that have been looking at and working with historic bottles for decades to positively identify anything more than a fraction of the fragments they look at. Even then it is more often an educated guess instead of an absolute determination unless there is some distinctly diagnostic feature (e.g., embossing, unique shape) that is unmistakable. Likewise, there exists (at least to this authors mind) no reasonable possibility of creating a "key" for identifying a portion of a bottle type much less a specific bottle. The difficulties of identification and dating early Australian glass artefacts (sic) from observations of mould seams, or embossed names and trade marks, can be highlighted two ways. Traditionally made bottle*: 1 in 50 and confined to the pontil mark on the base. Dip moulded bottle: 1 in 25 from the circular shoulder blow-over mark. 3-piece moulded bottle: 1 in 12 from the circular and two vertical shoulder seams. 2-piece moulded bottle: 1 in 6 from the circular base and vertical body and shoulder seams. These mean frequencies would be increased for artefacts of larger size and decreased if less than 400 sq. mm. in area. Although embossed names and trade marks of suppliers, distributors and glass manufacturers often provide the most valuable dating information, similar difficulties relating to frequency of occurrence exist at present. Only about forty of the seven-hundred and seventy trade names cited in the Sydney papers prior to 1850 appear at present to be associated in any way with identifiable glassware. The position for broken glass artefacts is even worse. Only a small part of each bottle, or other glassware, is usually sealed or embossed and can provide markings. Also, early consignments of common 'black' bottles were often up to several hundred times the quantity of embossed luxury products. Thus, potentially datable features may only be found once in several thousand pieces. Although this difficulty may be overcome by directing attention to clear and colourless artefacts, they only form a minor proportion even though they constitute about one-third of the names advertised at that time. The best that can be said about fragment identification/dating is that if the fragment is large enough and clearly shows some useful diagnostic features, then what information that is possible to determine from it would follow the bottle dating and identification information found throughout this website. Obviously the bigger the fragment (or the more fragments from the same bottle) the higher the likelihood of gleaning information from that fragment (fragments) about the bottle they were originally part of. Comparison of significant fragments with the hundreds of images provided via the Bottle Typing/Diagnostic Shapes complex of pages is also an option the will often lead to at least partial identification success. The subject of bottle fragment identification will be addressed - to the extent it can - after completion of the rest of this website (2012 or later). It will probably be approached through an assortment of examples similar to the approach used on the Dating Examples page. Specifically, the author of this website will take users through the thought processes and information he uses to positively or tentatively identify a variety of actual bottle fragments. This will be based at least in part on the information found on this website. Working through the process with real fragments (with lots of images) should provide some feel for how this difficult subject could be addressed. Just keep in mind that in the end, fragment identification is still largely a matter of extensive hands on experience with a lot of bottles of all different types from widely varying timeframes since a wide knowledge base is necessary to reasonably narrow down choices. There simply is no easy solution possible. Return to the top of the this page.